I know how you feel…As mothers, we are always on the go, always doing something for someone and hardly ever get time for ourselves. Well, that is just the point, my friends. We need time for ourselves each and every day. We need those few moments to restore our soul and feel refreshed. We need to fill up our cups so we can pour out into others. I have gone through many years of late nights, and all night long nursing sessions. I have had seasons where I felt I could never catch up on sleep and would likely always have dirty hair. I have tried many different things to try and get in my quiet time over the years. I have stayed up late, I have tried to get in some time during the mid day nap…. 1. You Can Start Your Day With Purpose. We have all been there. When you wait to wake up until after your kids are up, you start the day in reactive mode. It tends to be chaos and inevitably, things go wrong. People don’t know where they put things, who needs to do what, mom hasn’t had her coffee yet…and so on. By waking up a little earlier, you can start your day proactively and intentionally. You choose what time you will wake up, how your morning will go and what will get done. When you start your day with intention- it’s up to you. 2. You Can Have Some Quiet Time. I don’t know about you, but I NEED quiet time to myself in order to maintain my sanity. I actually crave it. With 7 children at home, and as a homeschooling mom, quiet time is not so easy to get during the day. The only time that I have found the house is truly quiet and peaceful is early in the morning. I can drink a hot cup of coffee, spend some time with the Lord, JOURNAL, read a book…that time is mine. 3. You Can Be Productive. I have learned that I am far more productive in those early hours of the day. By mid afternoon, my brain feels a bit fried and it is harder to concentrate. I do not do all of my work during the early morning, but if I know I have something that needs my concentration, I can do it before the children wake up. I get more done in far less time when my house is still asleep. After I have had my quiet time and some work time, I tend to tidy up the kitchen or the school room. Everyone is happier when we start the day with those rooms picked up! It is so much easier to for me to take just a few minutes in the morning to clean up, than to try and get that done when the house is going at warped speed. 4. You Can Enjoy an Un-Rushed Morning with Your Children. Mornings can be hectic for any family – whether you work outside the home or inside the home, whether you send your children to school or teach them at home. However, when I start my day early, with intention, I am more relaxed when I greet my children in the morning. I have filled my cup, both literally and figuratively. They don’t see me frazzled and on edge first thing in the morning. We aren’t trying to find things at the last minute and I am not not reheating my coffee fifteen times. I am able to spend those first moments with my children, un-rushed and thankful for another morning. 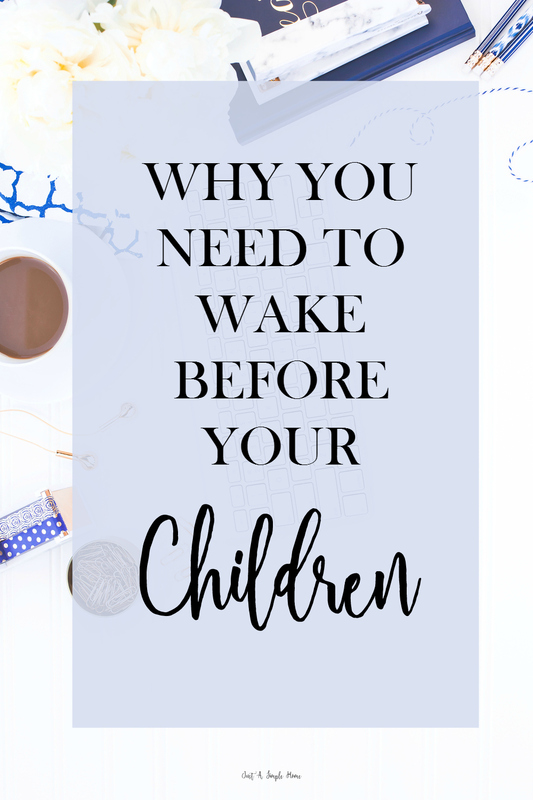 Do you wake in the morning before your children? Why or why not? I don’t have kids at this point but I am so an advocate of making the most of your day by waking up early! This just further proves my points. Those morning hours are some of my most sacred. I definitely believe in getting up before the babes. I really enjoy having a quiet cup of coffee before they get up, and feel I am then able to focus more fully on them once their up. Yes, that is exactly it! It doesn’t always work out perfectly, but when it does, it is magical! This is awesome. I completely agree. There are so many nights when my little one won’t go to bed on time and I find myself getting agitated bc I haven’t been allowed that “silent@ alone time. Doing it in the morning would at least guarantee that it happens once during the day! Sleeping in is one of my guilty pleasures. I have terrible self control when it comes to getting up. But I REALLY need to. This will be my goal for the week! I really love this. It’s so tempting to just sleep until the kids do, but I agree, I always feel better when I do end up waking up before they do! I have two daughters (8 & 5) and I agree with you. I am up before them most days as I have to prepare to send them off to school. I’ve been waking up early before my daughter for years now. Those hours are some of my calmest and most productive of the day! I sometimes wake up before my son, but not always. I do most of my blogging late at night after he’s in bed, so a lot of times I would prefer to sleep in the morning because I’ve been up so late the night before. I’m definitely more of a night owl than an early bird! Okay that was me in the beginning, huffing and puffing and maybe a little bit of whining. I’m such a lover of sleep and I love to catch up on it whenever I can. But during the week I find it’s necessary for me to get up before the kids. It makes such a difference in the rest of my day & attitude. In fact we’re all better for it! So fantastic. This is something I have been trying desperately to do but can’t seem to get there. But the idea of an unrushed morning sounds perfect! Yes to all these reasons! I love having time to wake up a little and do a few things before the barrage of questions and complaints begins in the morning. I totally agree with you on this! Especially the quiet time part! I have been doing this lately and it has changed my life! I need that quiet me time before the chaos and it really gets me ready and organized for my day! Yes! It’s a must for me, otherwise I’m in a terrible mood all day. I need that alone time! Lol, at least you get it done! And they see their mom spending time with the Lord, so you are setting a beautiful example! This is what I have been trying to do this lately. All of your reasons are the same as mine! Yes! I don’t have kids yet but I am a huge proponent of waking up before I need to and I plan on continuing this. This is fine and dandy for those that have kids that sleep past 5:30/6:00 in the morning. Getting up before the kids would mean 4:30 and finding a way to stay absolutely silent. I agree it doesn’t work for everyone in every season, Jamie. I actually got up at 4:30 myself today and it was wonderful! I couldn’t do it every day though. I hope you find some time for yourself! Definitely! But there were seasons of exhaustion where it wasn’t possible. We simply need to do our best and then learn to be flexible with the rest. Sometimes the best decision is to wake before 5:00 and bake cinnamon rolls from scratch. Others, it’s best to sleep until 9 and rock the “mom bun” and pour bowls of fruit loops. The best I can do for my kids is to do give them the best of me. I’m also a homeschool mom, though, of 3. Thank you for this reminder! I know I need it, so I will press to wake up before my kids for some me time…i NEED it to survive hahahahaha. Lol, that’s exactly it! It might be hard at first, but worth it!